My Sweet Bean and Her Pod: Give Away Time!!! Pump Peelz, Baby! It's been too long since I've hosed a give away around here. 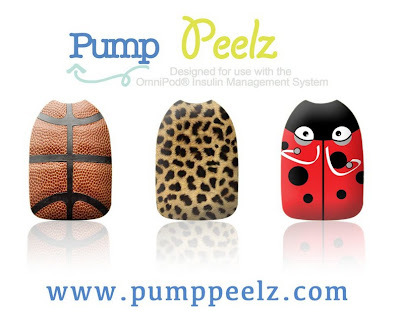 So, with the arrival of Bean's Pump Peelz on Thursday, I thought I'd see if they would consider letting me give away a couple of peelz on the ol' blog-a-roonie. 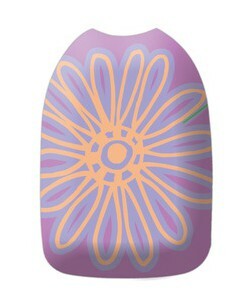 They are vinyl stickers that are reusable and waterproof. They easily wrap around the pod and viola, you have a snazzed up pod! and last night's pod change brought about the Flower's turn. She got several comments about how cool her pod looked at school on Friday, even one from her teacher from last year. I love that she can customize her pod and make it 'cool.' She's never had a problem showing her pod, or wanted to put it somewhere it couldn't be seen, but the Pump Peelz make it even more fun to show it off! They have lots of Peelz to choose from, appropriate for girl podders and boy podders and 'grown-up' podders! There's Sports, Patterns, Textures, Holiday, Music, Cartoons, and Miscellaneous. The next one that's a 'must get' in our house is the Candy Corn. So, here's the scoop on the give away! The winner will get to choose two (2) Pump Peelz...let me know the ones you want and where to ship them and I'll pass the info along to Pump Peelz. 1. Leave a comment on this blog post. 2. Llike' Pump Peelz on facebook and then leave a comment here telling me you've done it. 3. Post about the give away on your blog and then leave a comment here telling me you've done that. I will use random.org to choose a winner on Friday, October 12th. if you aren't a podder, but know one who'd like the Pump Peelz, feel free to enter...if you win, you can 'give the win' to them! Love this giveaway!! Please enter me! I already liked them on facebook! Q can't wait to try these out! I saw those awhile back, but never got any because Elise can be hot or cold when it comes to decorating her pods and I didn't want to spend the money... I'd love to give them a try for free though! these are SO adorable and I wish I could put them on Emma's Ping! I would like to enter the draw though because i have a good friend who's daughter is starting pumping on the Pod next week! HOW COOL!! Do I have to do all 3 or pick one? Cuz I've completed options 1 and 2. Do I need to do option 3 as well? Wooo hoo! I would love to try those out for Adam. so cool! I already like their page too...I've been following along! Just posted about them on my blog! love to win! baby #1 due in feb! I also "like" Pump Peelz on Facebook!